Red gurnard are a major bycatch of inshore trawl fisheries in most areas of New Zealand, including fisheries for red cod in the southern regions and flatfish on the west coast of the South Island and in Tasman Bay. They are also directly targeted in some areas (e.g. GUR2). Red gurnard is a minor bycatch in the jack mackerel trawl fishery in the South Taranaki Bight. Red gurnard is, by virtue of its wide distribution in harbours and shallow coastal waters, an important recreational species. It is often taken by fishers targeting snapper and tarakihi, particularly around the North Island. Red gurnard is managed by the Ministry for Primary Industries using the Quota Management System (QMS). 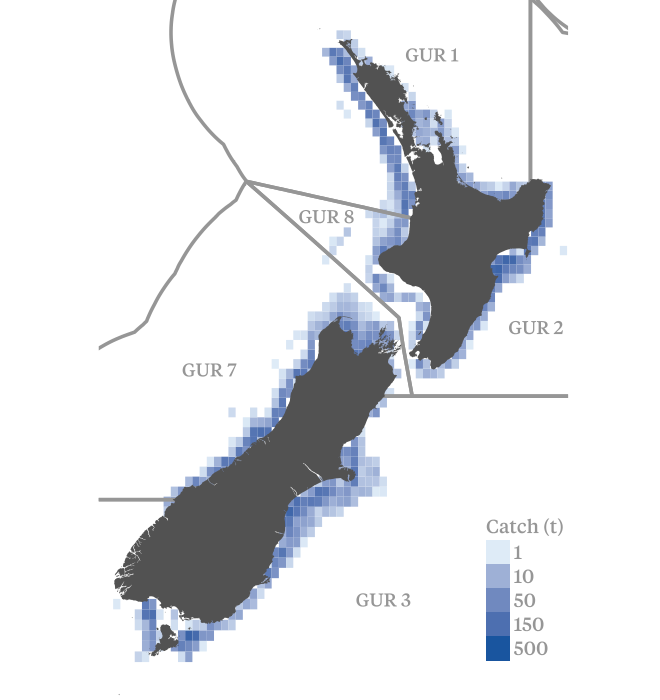 The risk assessment covers nearly 90% of gurnard caught commercially in New Zealand. The most recent stock assessments for GUR 1 were undertaken in 2013, GUR 2 in 2017, GUR 3 in 2015 and GUR 7 in 2017. All used standardised catch per unit effort (CPUE) analysis. Each stock was assessed against stock-specific reference points consistent with the Harvest Strategy Standard. The Ministry for Primary Industries concluded that each stock was as likely be above the target reference point, and unlikely to be below the soft and hard limits. Given the above, the combined stock appears highly likely to be above the point of recruitment impairment and fluctuating at or around levels consistent with Maximum Sustainable Yield. The risks of the inshore trawl fishery to endangered, threatened and protected (ETP) species have some regional differences in risk based on the distribution of ETP species. The main potential ETP species interactions in the inshore trawl fisheries are with seabirds and marine mammals. Risks to seabirds associated with New Zealand’s commercial fisheries have been assessed through a hierarchical series of risk assessments. In the most recent assessment, only one species of seabird, black petrel, had a median risk ratio higher than 1 (or upper 95% confidence limit higher than 2). For all other species, current rates of fishing related mortality were not expected to hinder the achievement of management targets (i.e. the risk ratio was <1). The specific contribution of inshore trawl fisheries to black petrel potential fatalities is not known, but total estimated captures in trawl fisheries represent a small fraction of the overall estimated captures for black petrel. Based on rates of observer coverage, it is estimated that between 400 – 600 seabirds are captured in New Zealand’s inshore trawl fisheries each year. There is also evidence from the most recent risk assessment that risk to black petrel has declined since the introduction of the current National Plan of Action - Seabirds in 2013. Accordingly, the direct effects of the inshore trawl fisheries appear highly unlikely to hinder recovery of ETP seabird species. With regards to Hector's and Maui dolphin, given the very low median estimates of annual fatalities in the trawl sector, it is unlikely that the trawl fishery will hinder recovery of either species. However, given the preliminary estimates of risk for common dolphins, including the possibility that the risk ratio from commercial fishing may be up to twice their sustainability threshold, and the inshore trawl fishery is considered an important contributor to risk for this species. The installation of on-board camera monitoring for some sectors of the fleet (phased in from 1 October 2018) will likely assist in better estimating the extent of interactions between marine mammals and inshore trawl vessels. The final results from the New Zealand Marine Mammal Risk Assessment are expected in 2017. While objectives broadly consistent with Components 1 and 2 are specified in the Act and Fisheries 2030, and are therefore implicit in the fishery specific management system, it is not clear that explicit short and long term objectives for inshore trawl fisheries are in place at this stage. Nevertheless, the fishery management system is subject to regular internal review through the fisheries Plenary reporting process and decision making is guided by the Harvest Strategy Standard. The Ministry for Primary Industries implements a comprehensive peer-review process for all science research that is used to inform fisheries management decisions. The inshore trawl fisheries interact with a range of ETP species. Although recent risk assessments indicate the extent of estimated captures of seabird species should not hinder recovery, there is uncertainty over the impact of the fishery on common dolphins. Preliminary results from the New Zealand Marine Mammal Risk Assessment identified common dolphin as the marine mammal species most at risk from commercial fishing. The outlook below provides a qualitative judgement about the likely future performance of the fishery against the relevant risk assessment criteria over the short to medium term (0-3 years). Assessments are based on the available information for the species and take into account any known management changes. Target species (GUR 1) - Uncertain: Red gurnard is taken mainly as a bycatch in GUR 1. Abundance appears to be somewhat cyclical, based on recruitment variation. Without information on recruitment it is not possible to predict future stock trends. The Total Allowable Commercial Catch (TACC) is set substantially above current catches. Target species (GUR 2) - Stable: The stock is very likely to be at or above target levels, and it is unlikely that the current catch or TACC will result in the stock falling below the soft limit. Standardised Catch per Unit Effort (CPUE) in 2015–16 was well above the target. Target species (GUR 3) - Stable: Current abundance is at historically high levels and is unlikely to decline below the soft limit in 3–5 years. Target species (GUR 7) - Stable: The West Coast South Island trawl survey relative biomass indices from 2015 and (preliminary) 2017 were by far the highest of the entire time series. It is unlikely the stock will decline below soft limits in the next 3-5 years. Bycatch and ecosystems - Improving: The information base to examine the ecosystem impacts of inshore trawling is growing. The introduction of electronic monitoring on at least some inshore fleets should improve understanding of catch composition and allow more sophisticated assessments of the impact of the fishery on non-target species. ETP species risk assessments have been continuously refined over recent years, resulting in reductions in estimated risks from inshore trawling. Habitat research is ongoing with new studies planned to better understand the dynamics around impact and recovery. Ecosystem modelling is also underway to better understand the trophic impacts of inshore fishing.